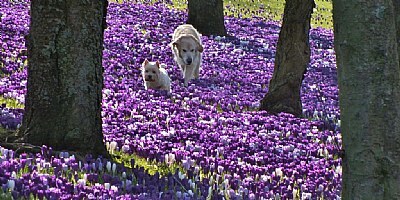 Beautiful story telling image within fine composition and with fine contrast of flowers color and dogs color. Nice colors for this one Bruce..
A very colorful shot of the doggies wondering around in the flowers. Congrats on the award. Fantastic capture Bruce, excellent colour contrast and composition. congrats on your well deserved SC award. A beautiful captue Bruce,you have encompassed all that is good in nature and with friends. well deserved award.Agree with Riny. Great capture. The frieds have the right color against the flowers. pets can be the most important part of a persons life.they give us comfort, unconditional love and they are always there for us! Good job Bruce.